44,000 pounds of steel arrived at The Generator this week, enough to bring the mother and calf's inner structures to completion. Now just add labor, and love! 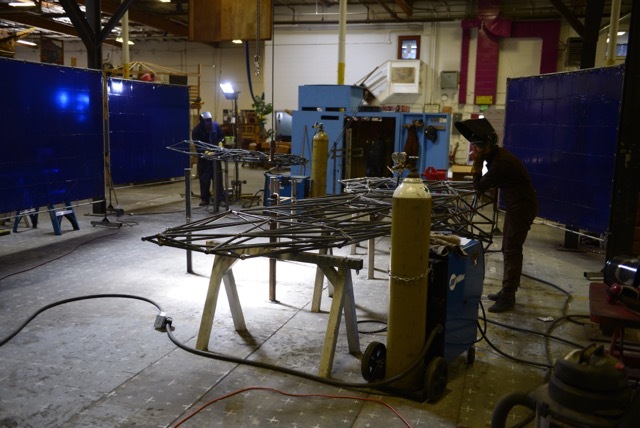 With the structural welding now finished on both whale flukes, we are moving down the body of the mother whale and constructing the left flipper. As we build down the body towards the ground each layer must carry more load, and therefore be made of a thicker steel. We all are a bit in awe of the 4 inch bar stock that will be used for the strongest parts of the sculpture... Each individual bar weighs 900 pounds! After a full day of unloading the steel from the delivery truck, the mass of this sculpture is really starting to sink in. With bigger bar stock comes the demand for bigger balls. Ahem, spheres! Andy writes a new program for the CNC lathe each time we need to manufacture a larger metal connection point for the structure. Making each ball from scratch is a bit time consuming and tedious, but watching the lathe carve each one out of solid steel is just beautiful! Handling this process ourselves is the only way we can afford to work, since purchasing complete spheres from a manufacturer would seriously inflate our budget. After a month of solid work each crew member's strengths have come to light and we are consistently improving our work flow. 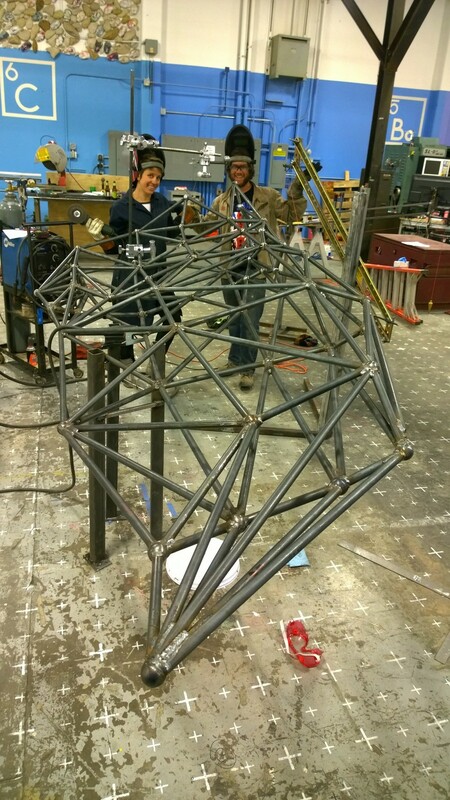 Our night owls place coordinates until almost dawn, and then the few that rise with the sun come in to weld everything into place. Working with a crew full of artists, builders and volunteers who love and respect each other is a brilliant thing. The Pier Group is on a roll! For our local friends and fans: Remember to get your tickets to The Space Whale fundraiser on May 27! We are so stoked to party with everyone!